Big Bear Lake Dock Club home page. Home of The Dock Club of Big Bear. 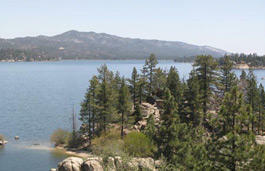 The Dock Club at Pine Knot Landing proudly calls Big Bear Lake its home. Boating here is an experience families enjoy year after year. The lake is a fresh water lake seven miles long. The averagewidth is 1/2 mile, with a maximum depth of 72 feet and over 22 miles of shoreline. One of the most beautiful destinations in Southern California!